Chances are if you're a Club Penguin fan you already know all about Puffle Launch (you can find it in the Penguin Community in the Pet Shop). If you've just been scanning the shelves of Android Market or the App Store and have wondered what it's all about, allow me to enlighten you. 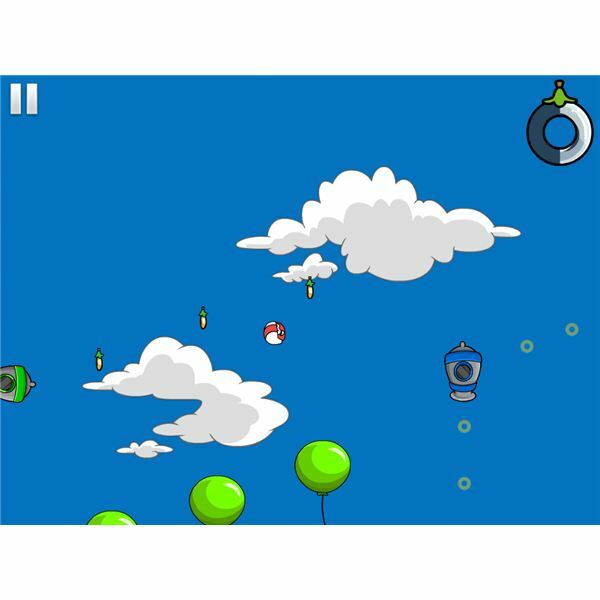 The basic idea is that you have a little pet Puffle (fluffy fur ball) that gets fired from a cannon and you need to get him to eat as many Puffle Os along the journey as you can. Sometimes you get fired from one cannon to another and simply have to tap when you want your Puffle to be fired out, but sometimes you have to navigate your way by tapping either left or right to get the Puffle to move in the air. If you fail to reach the next cannon you either fall through the clouds or you land in the water — either way it's game over. You complete each level by reaching the goal of the giant Puffle O at the end of the level — you don't have to munch every single Puffle O in the game to complete the level. There are obstacles along the way and various different cannon types. 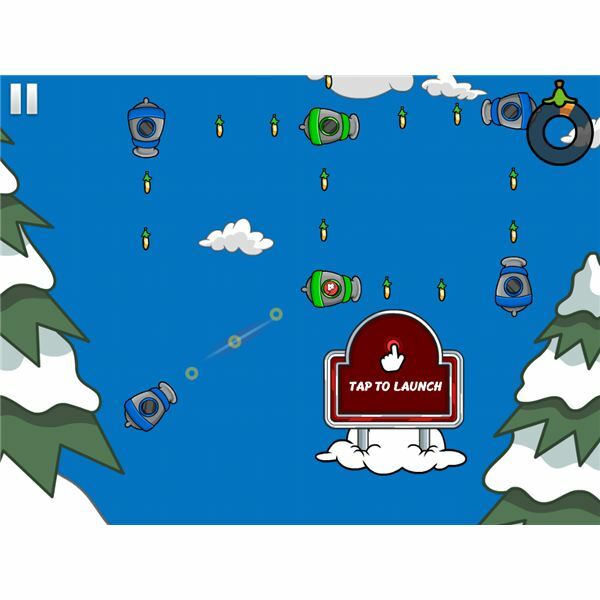 It's a simple little game in terms of controls, and I'm afraid it just might be that kind of Angry Birds game that is simple to operate but fiendishly addictive. There is one thing standing in the way of this game becoming that successful though. The biggest downside for me is that there is a huge leap in the difficulty level after the first couple of games. Considering this is really a game for children I think there should perhaps be a choice of how hard to make the level, or at least an option to skip a level, as it can get really frustrating playing this as an adult, never mind a child. There are currently only 24 levels to Puffle Launch, but I hope there will be more added to really compete with the Cut the Rope type games, and other games like Angry Birds for Android, and for iPhone. There are hidden bonuses you can get to add more options and functionality to the games currently though. If you complete all levels and collect every single Puffle O there is to eat, you can unlock four hidden time trial levels. There is also Turbo Mode (beat all levels in a combined time of 4.5 minutes or less) and Slo-Mo. 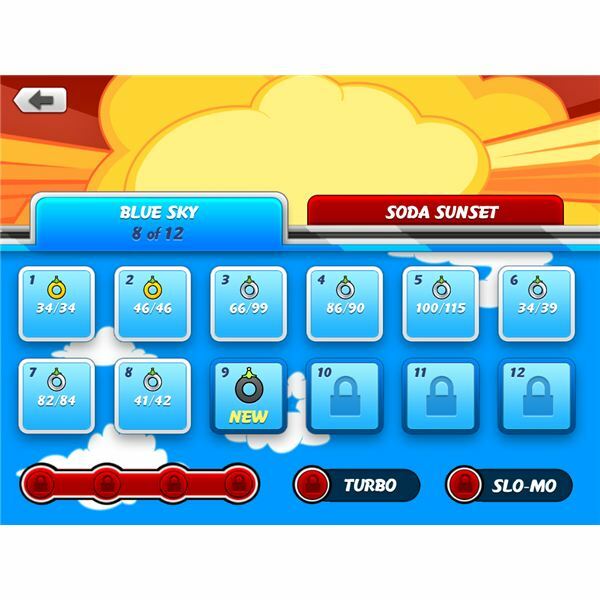 You need to complete all levels in Turbo Mode before you move to Slo-Mo. 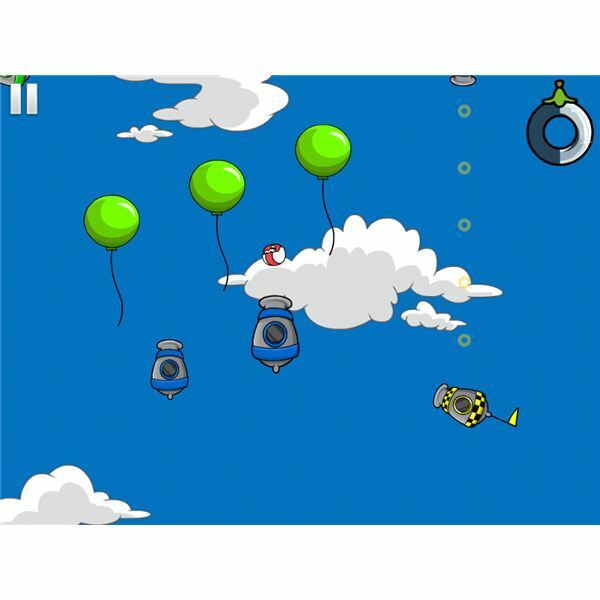 This game is all about firing your Puffle out of the cannons, so it makes sense to get to know the different color cannons and what they can do. Blue cannons send your Puffle directly to the next cannon. Green cannons change direction, but stop for a second or so at each turn. Make sure to tap slightly before you think you need to — the tap to touch isn't that responsive in quick situations. Red cannons change direction, but they don't stop. They just keep turning around until you tap to launch the Puffle. Yellow cannons are checkpoints. If your Puffle makes it to one of these it means if you later let your Puffle fall into the water you won't have to start the game from the beginning. Purple cannons are totally in your control. You spin them around according to where you want them to go and then tap to fire. Use green canons especially for making sure you get as many Puffle-Os as possible. The trick in the later levels is all about using the obstacles to your advantage. These obstacles can be anything from pianos, groups of balloons, giant green balloons, and even cacti. It's fair to say you need to avoid the piano wherever possible as it will just knock your Puffle for six and out of the game. 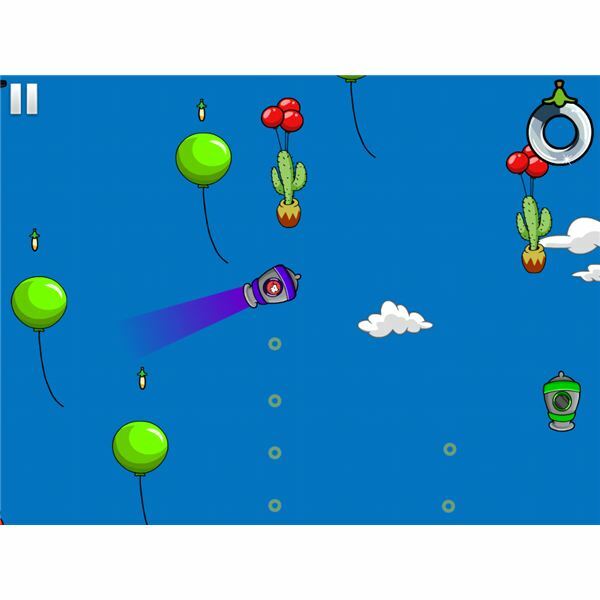 Green balloons are the best obstacles to use, but try to bounce on top of them. They essentially work like a trampoline so give you height to reach another cannon, or take you closer to another obstacle. You can often utilize them as bouncy steps, so boing from one to another to get to the next cannon. Cacti are also quite useful, but you need to approach them with a bit of caution. Use the sides of them to knock you through the air where a cannon can't be reached. This might take a few attempts as you take in the landscape and see where you are aiming for — another problem with this game is that you can't scroll up and down to see where you are meant to be going. If you are a Club Penguin devotee (you don't even have to be a member), then make sure you get any Puffle Os you collect on each level converted to coins that get credited to your Club Penguin account. This is just a simple case of tapping on the icon at the bottom right of the menu screen and putting in your penguin name and password. You don't have to log on each time, the game remembers the details and your account gets automatically updated. I'm sure as more levels are added there will be even more to discover, and plenty more Puffle Launch tricks, tips or cheats to find, but if you have any additional advice for completing the current levels please let us know in the comments field below. Written through author's experience of playing the game.